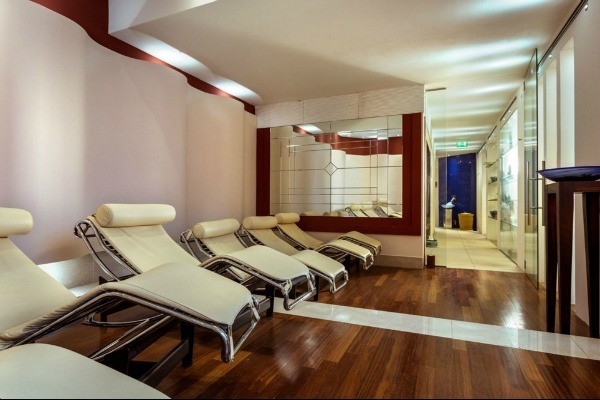 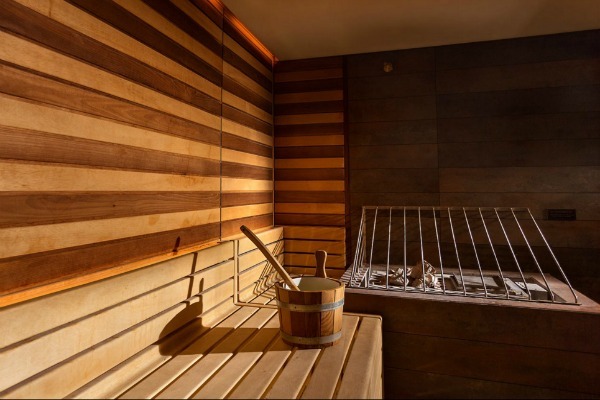 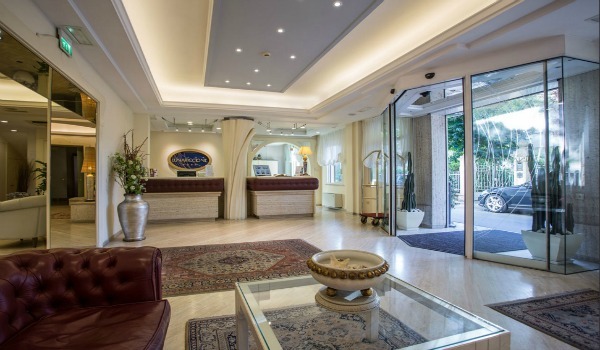 Relaxation and wellbeing, fun and sophistication: a stay at the Hotel Lunariccione & Acqua Spa offers all this and much more just a few steps from the seafront and the famous Viale Ceccarini. 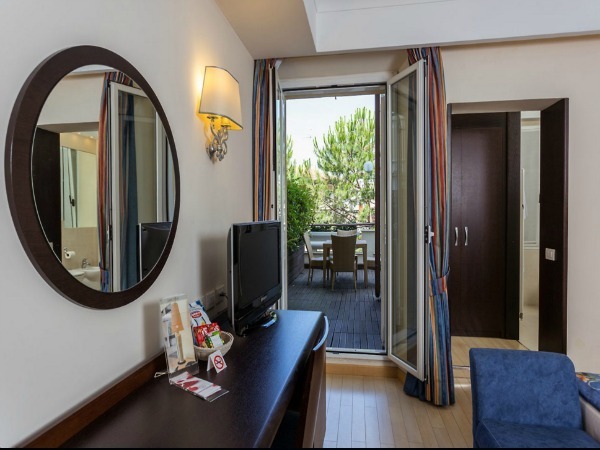 Elegant rooms and suites with modern comforts, a refined restaurant, a heated indoor pool among the largest in Riccione, a wellness centre with a sauna, Turkish bath, and beauty treatments. 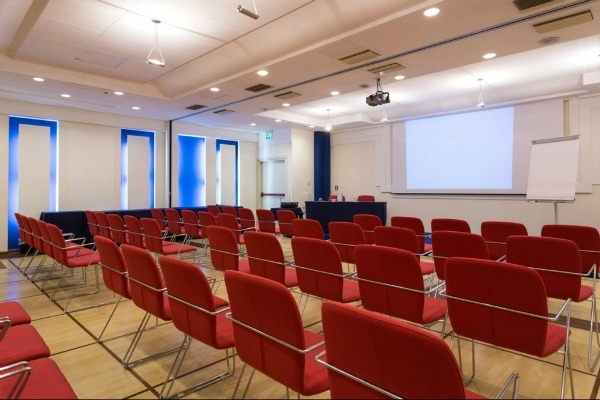 In addition, there’s a Congress Centre with hi-tech equipment for a variety of applications, a private and secure underground car park, and free Wi-Fi internet connection. 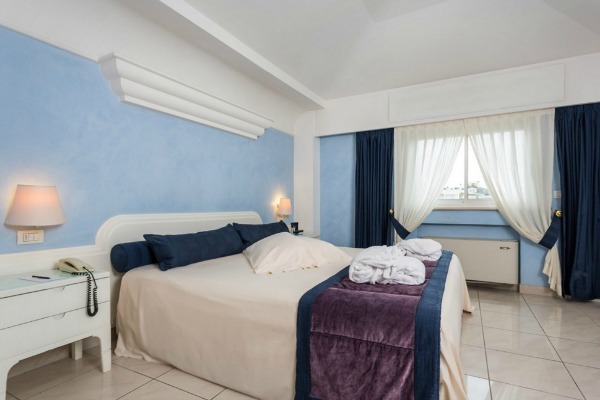 The hotel is a real refuge for those looking to explore the coast of Emilia Romagna and relax in a quiet atmosphere with many exclusive services. 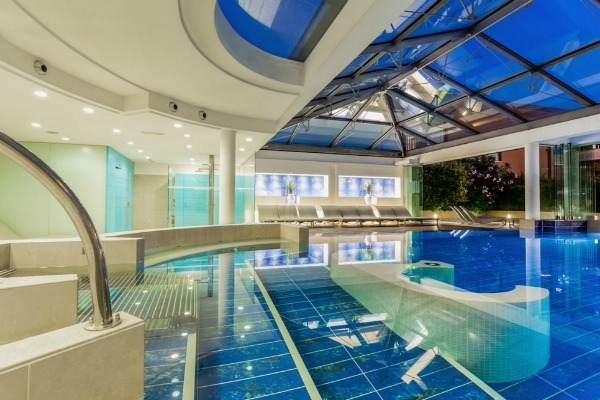 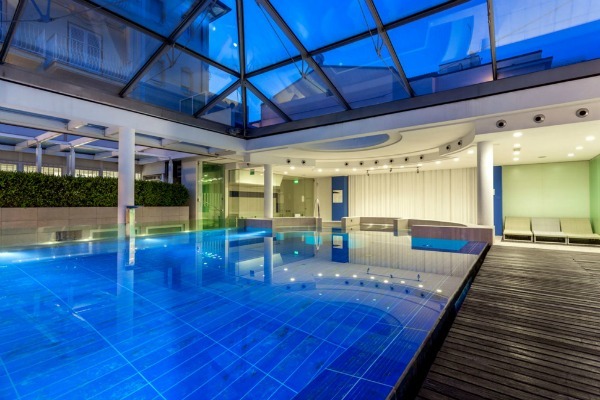 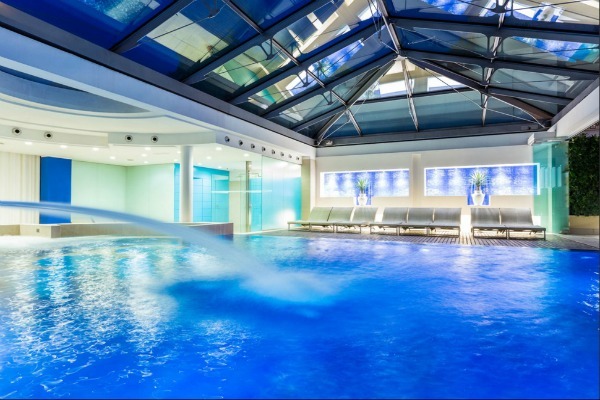 The AcquaSpa of the Hotel Lunariccione, which is also open to the general public, contains a heated indoor pool with a glass pyramid overhead and a cervical massage cascade, a blower, effervescent beds, counter current swimming machine and hydro-massage tubs. 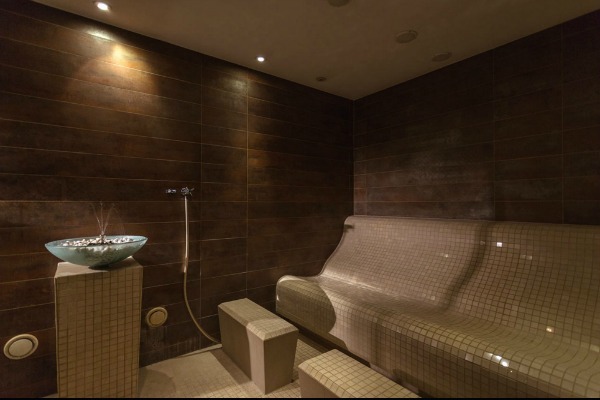 The spa has hammams, a biosauna, tepidarium, emotion shower, Turkish bath, ice fountain and a relaxation area with a herbal tea bar. 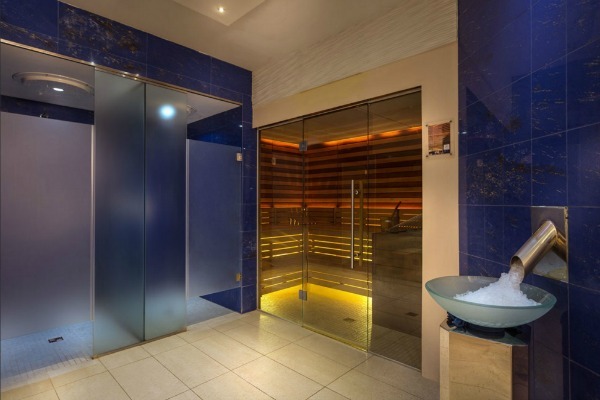 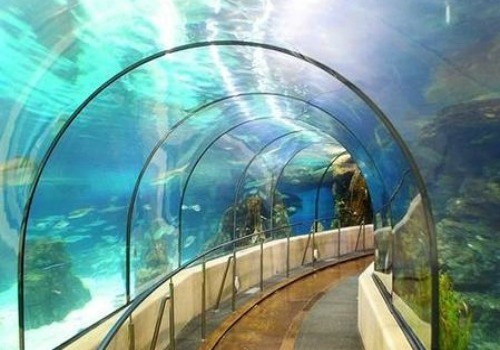 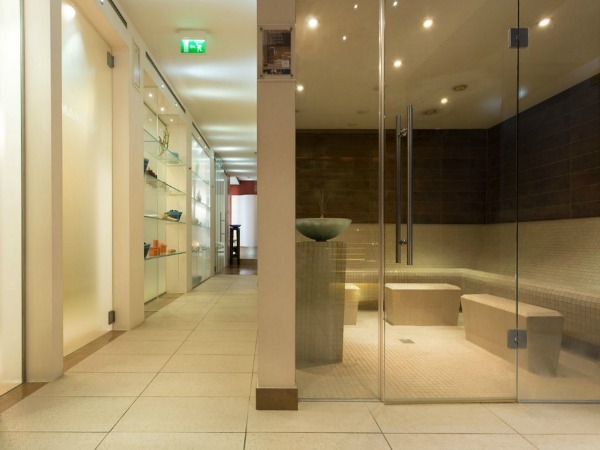 The spa also contains an exclusive Kneipp circuit with a river stone walk combined with water jets, an area for massages and beauty treatments that can be selected from a vast menu that covers a range of western and oriental techniques administered by qualified experts. 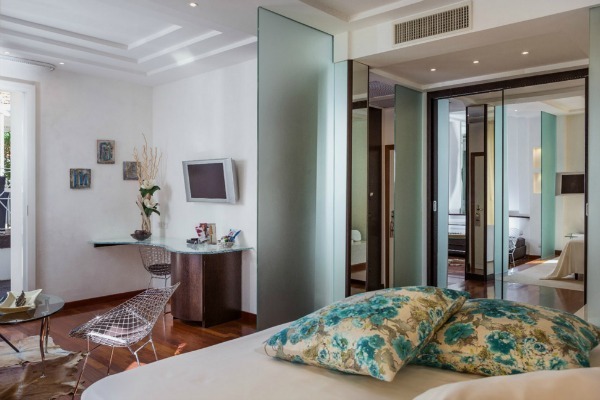 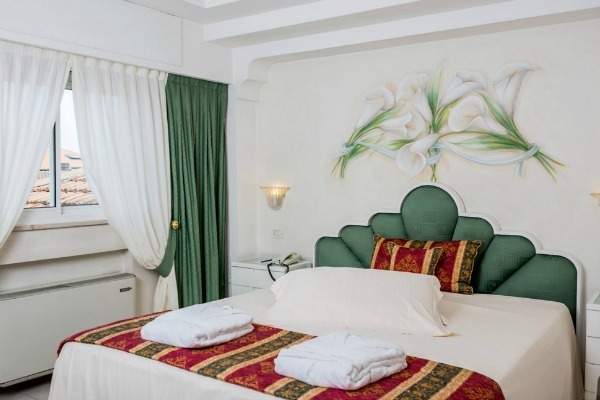 The 45 bedrooms of the Hotel Lunariccione consist of Sunny (single, double or triple) and Star types, alongside the Luna Suite and the Hele O’Nor suite, each of which includes services in the price of the stay. 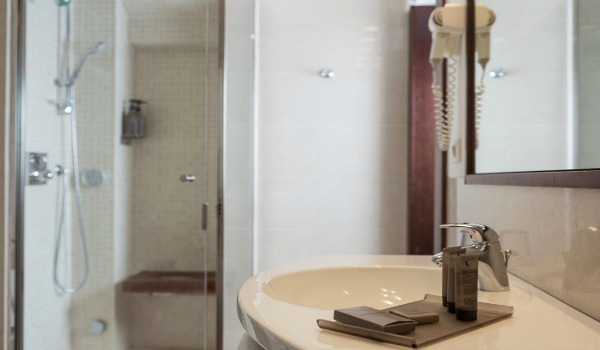 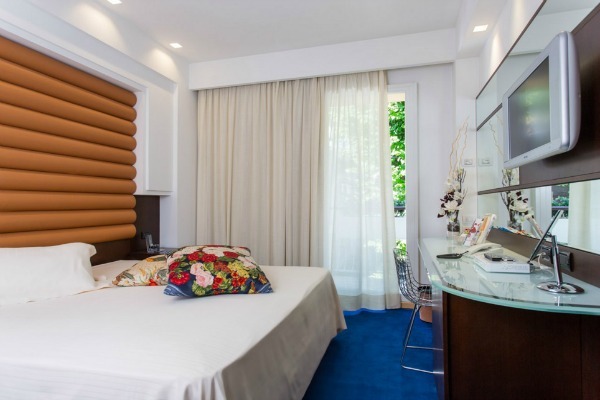 All rooms and suites have air conditioning and heating, satellite TV with Sky channels and pay-per-view, a minibar, a safe, and free Wi-Fi internet connection. 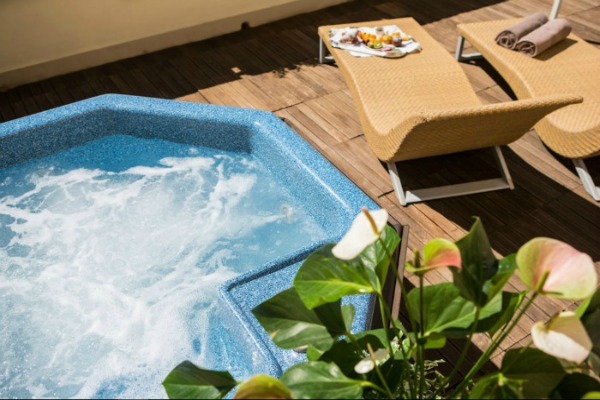 The Luna Suite has a living area with a sofa bed and a double bedroom, while the two presidential Hele O’Nor suites have a private sun terrace, an outdoor Jacuzzi and a gazebo. 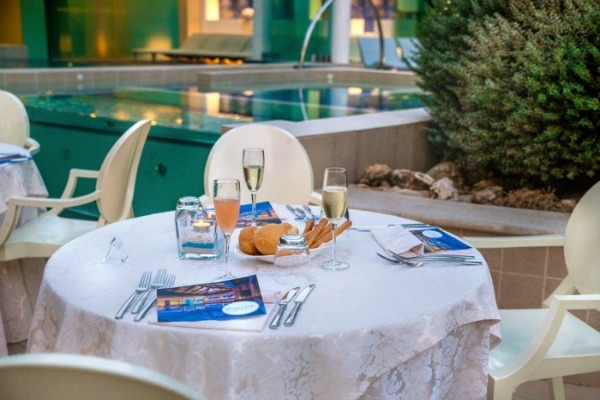 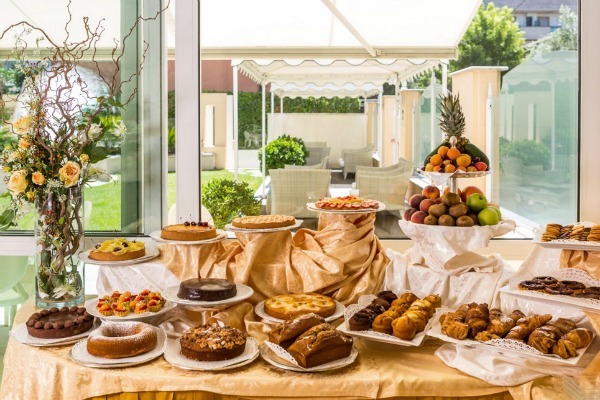 The gastronomic wellness at the Hotel Lunariccione begins in the morning with breakfast served on a veranda opposite the pool, including a sweet and savoury buffet, with fresh homemade pastries. 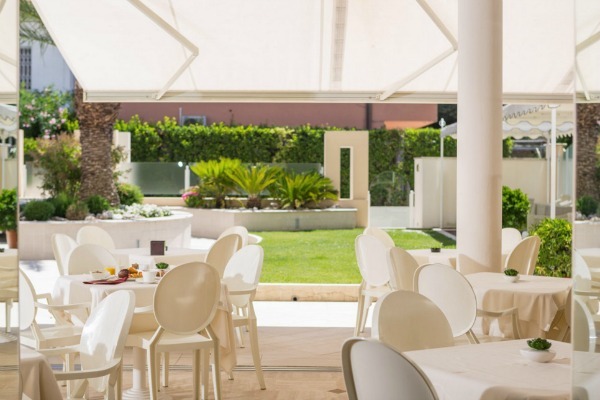 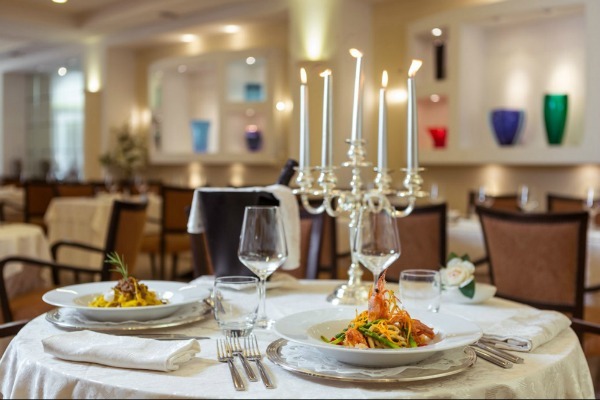 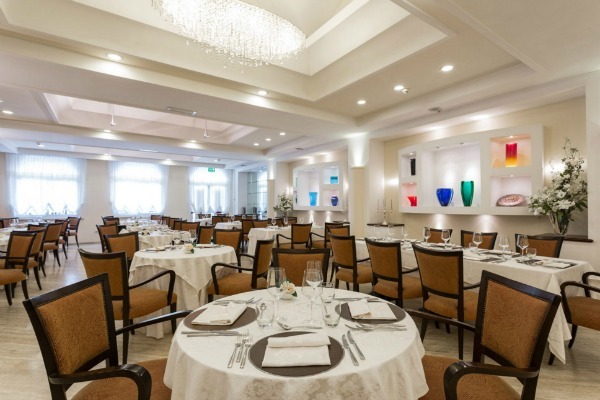 At lunch and dinner the hotel’s restaurant serves refined cuisine inspired by traditional Italian recipes. 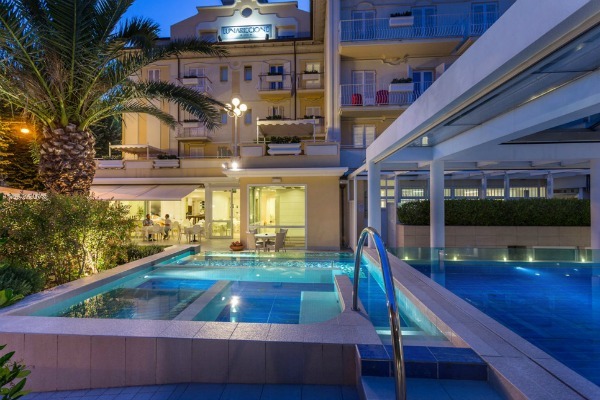 Riccione and nearby Rimini are among Europe’s most popular seaside destinations, with a tradition in hospitality that includes, as well as perfect organisation, a range of recreational, sporting and cultural activities available all year round. 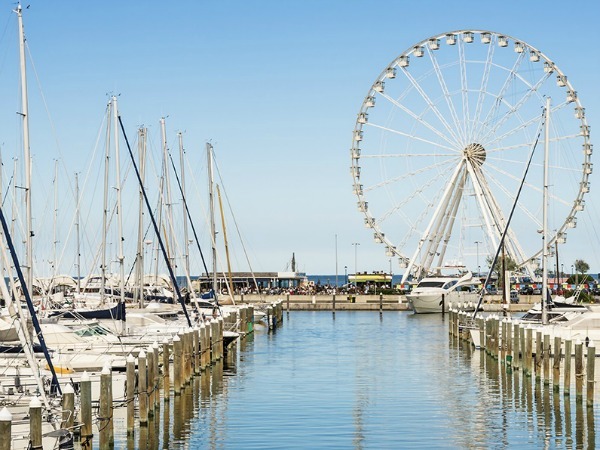 A stroll along the seafront is a traditional starting point for visitors, as are the nights out in the numerous discos and bars located in the centre or just outside of the town. 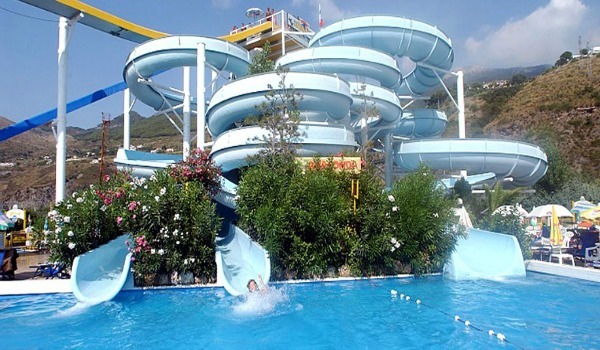 The hinterland offers many points of natural and cultural interest. 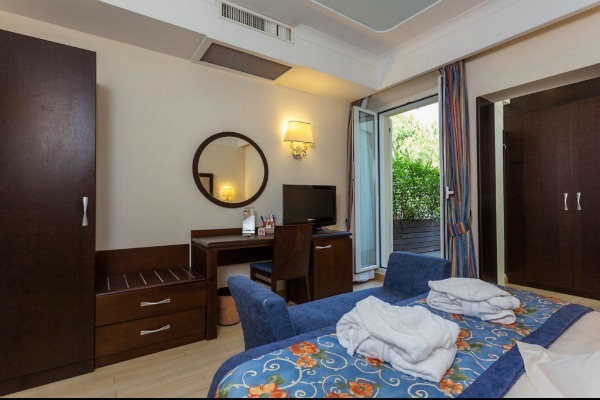 Places to visit include: Coriano, just 8 km from Riccione, a town surrounded by historic farms of vineyards and olive groves and the ideal starting point for a walk in the natural park of the Merano river and in the Rio Melo valley. 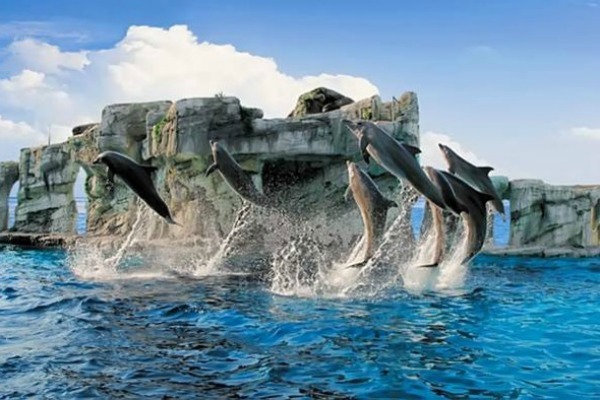 Near Gemmano, you can visit the Grotte di Onferno, of significant geological interest. 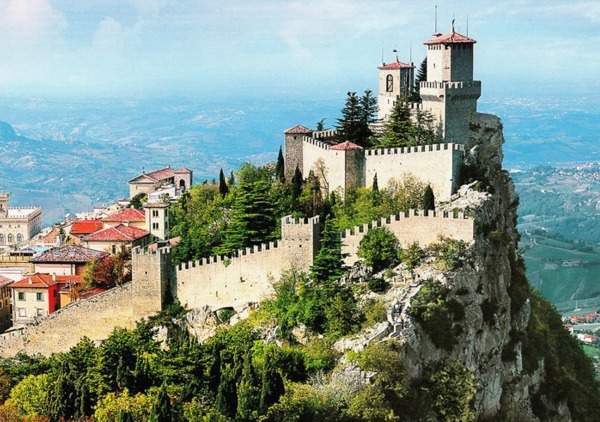 There’s Gradara, with its wonderful fortress, the ancient Montecolombo and the Church of San Martino that contains a wonderful tapestry by Brancaleoni, Montegridolfo with the famous 14th century castle, the Republic of San Marino and its famous path joining the three Towers on the mountain top, the village of San Clemente with a parish church designed by the Pope’s architect Luigi Poletti, and San Leo with its fortress that was once a prison for the Count of Cagliostro. 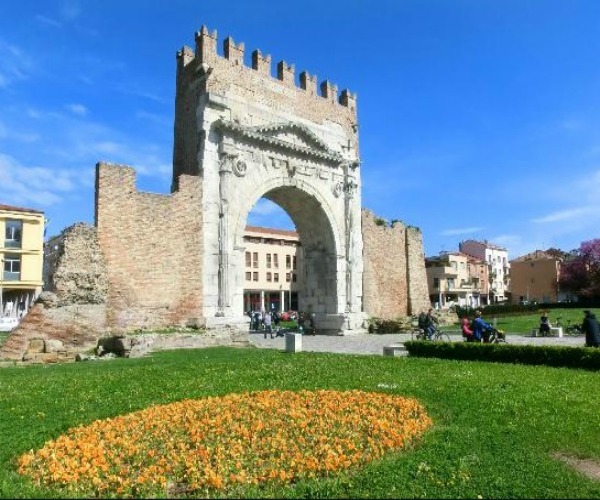 All of these towns hold their own traditional festivals, especially over the summer, where visitors can see the recreation of medieval and renaissance scenes in costume. 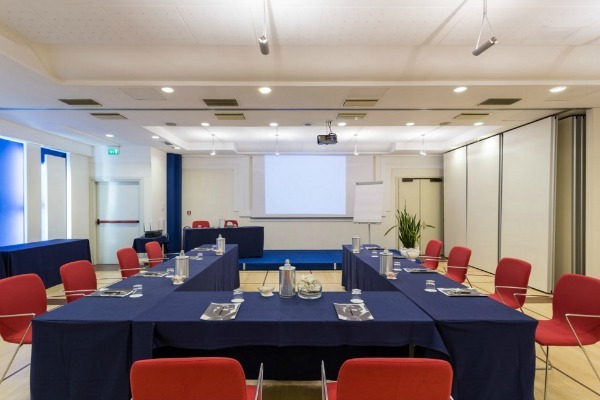 A little further afield but worth the trip of 52 kilometers, is Urbino, the birthplace of Raffaello, with the cathedral built by Federico da Montefeltro, the Palazzo Ducale and the National Gallery of the Marche with a large collection of renaissance works.